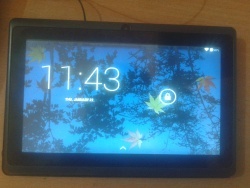 A Q8 style cheap tablet, but with an A33 SoC. Sell as 1Gb but fake android reporting!! Only 512Mb. Does not esist 1Gb q8 form factor tablet. Mainline U-boot OK from SD. Mainline Kernel OK from SD. For building u-boot, use the q8_a33_tablet_1024x600_defconfig target. Use 2016.11 with default A33 1024x600. Use the sun8i-a33-et-q8.dts device-tree file for the mainline kernel. With USB host mode only work with every type of cables. Unlike, other allwinner devices,Script.bin is not present in the vfat partition(nanda) as file. Instead, It is located 0x43000000, it's size is	0x00020000. script.bin can be extracted from /dev/mem using mmap() or sunxi-tools firmware_extractor. There are no UART pads available on this device. Instead, UART0 is multiplexed with the microSD adapter. Please refer to the MicroSD Breakout adapter for more information.. This page was last modified on 6 December 2016, at 17:32.